This month is infant and pregnancy loss awareness month. I am going to be completely honest. It doesn’t sit right with me. I lost my baby to SIDS. That was a 1 in a 1,000 chance. Yes, I am a part of the 1 in 4 statistics but it is a very, very thin slice of the graph Xavier falls into. His death was not common (Thank God). What we went through does not happen to a quarter of the Australian population. And so I don’t feel comfortable announcing I am 1 in 4. I know the aim of the campaign is to start people talking about the taboo subjects of miscarriage, stillbirth and infant loss. I know it’s about solidarity. I know there are no ladders in loss. I know that every one of the children remembered this month, and every month, is precious and loved – no matter their age or development. I know all of this and I support it, but I recoil when Xavier’s death is placed on the same shelf as miscarriage. I feel like a traitor even writing that. Within this community of loss we support each other equally and fully. I feel privileged to know women as mothers when their motherhood often goes unacknowledged. It is a gift to know their children through their love. I know they have their own struggles. And so do I. And they are different. As much as I acknowledge that there is no comparison in grief, no more than, no less than there is also no the same as. The loss of my son to SIDS is not the same as a miscarriage. It is not the same as losing a child to stillbirth. It is not the same as losing an infant to accident or illness. It is different. And that needs to be acknowledged. Each of those losses is unique and has its own pain. Not more than. Not less than. But apart. That uniqueness feels lost when I become 1 in 4. It was only a week or two after Xavier died. My very good friend, who has had more than her fair share of miscarriage heartache, and I were talking. I was trying to put Xaviers death into perspective. I said “perhaps there is no difference, perhaps his death is like a miscarriage”. I was struggling with my loss and honoring her loss now that I had a different perspective and understanding. She gently put her hand on my mine. She looked me in the eye and said “it’s very different.” That was a gift. The understanding that this pain held a different weight, that it was a different shape. It is an understanding that doesn’t always occur within the loss community. Every one holds tightly to the recognition of their motherhood. I understand why. It is often the only place that motherhood is recognised. There is a fear that acknowledging the differences in loss would lead to a reduction in the recognition of motherhood. But we are all different. We mother differently. Our losses occurred differently. Our journeys take different paths. We share so much in common, and we hold that up. But I think it has to be okay to talk about the differences too. This pregnancy and awareness month, I am 1 in 4. I am 1 in 1,000. And I am the only mother to my son. I wonder if most bereaved mothers have been there. Some-one utters the name of your child gone too soon. And there is a quick sideways glance, monitoring your reaction. Breath held. Will she be okay? The mother of a child gone too soon talks about her son. Furrowed brows. Concerned looks. Is she sliding back? A mother accidentally calls one of her living children the name of the baby who left. Silence. Is she delusional? In the months immediately after Xavier died, I would talk about him all the time. His name was burned on my heart and never far from my lips. I would speak of him to ensure he was not forgotten. I would speak of him because I needed to hear his name out loud. I would speak of him, between tears, because I needed to articulate my pain and I needed to remind those around me that it still cut deep. His name remains deeply engraved in my heart, but I speak of him less these days. And when I do speak of him, it is for different reasons. His memory and his legacy feels safer now. I do not speak of him to remind people he lived, or that his death caused me immense pain. I speak of him, because simply and beautifully, he is my son. When I talk about Xavier, I do so because I love him. It has taken time to get a point where I can talk about him simply because I love him. To a point where I can talk about him without the lingering sadness. Where I can say his name without tears. 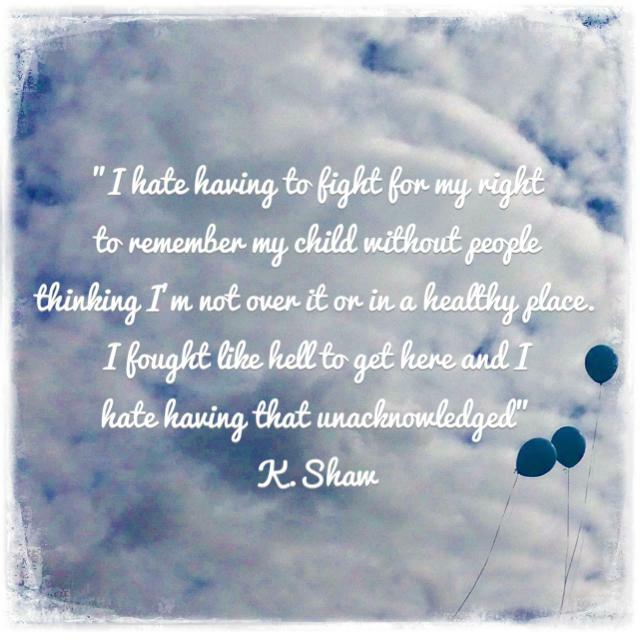 For any bereaved parent, this is a difficult and long-fought battle. Talking about a child no longer in your arms is not a sign of weakness, or sliding back, but rather a testament to strength. It is a part of integrating them into the fabric of life. It is something to be celebrated and acknowledged. If I choose to talk to someone about Xavier, I do so because I trust them with his memory. I know that they will cherish him. It is a gift, just as some-one speaking to me about Xavier is a gift. When someone talks to me of Xavier, my heart skips with happiness. When someone says, easily and happily, that Elijah looks like Xavier, I beam. When someone tells me something reminded them of my son, I want to embrace them. When a bereaved mother talks about their child, whether with a smile or with tears or with both, please accept it as a gift and a vote of extreme confidence in your understanding. Do not be afraid to say their child’s name, but rather know that your remembrance brings more joy than pain. Even if your kindness leads to tears – it’s only because you have given permission to drop the veil for a moment. A bereaved mother is, above all, a mother. A child that has gone too soon is, above all, a much loved son or daughter. And a parent, above all, loves each of their children. In reality, it’s that simple. There are days in the year that tear me in two. Christmas, Birthdays, Fathers Day, Mothers Day. There is the joy and the noise. The handmade cards and the sticky kisses. The impractical gifts and the restaurant meal. Hugs and laughter. One side of the coin. The other side yearns for solitude in the midst of all the excitement. Wishes for a moment of a peace and reflection. And more than anything, wishes another little voice joined in the commotion. Mothers day is hard for a lot of people. Those that have lost their own mums. Those, like me, that have a child or children in heaven. Those that have tried and tried to fall pregnant only to face another mother’s day without a baby in their arms. Those that yearn with all their hearts for a child but know it’s a wish that will never be granted. It is a day filled with flowers, breakfasts in bed and handmade cards. But it also a day filled with pain and yearning for so many. And all of those people deserve a little love on Mothers Day. I am fortunate to be celebrating today with my two earth-side boys, my mum, my grandmother and my mother-in-law. Surrounded by beautiful family. There is, as always, much to be grateful for. There is, as always, much to turn my mind from Xavier. The pain of missing him, now just a dull ache where once it was piercing, seems at odds with the day. And yet, it must be part of the day. I find it easier to reconcile my feelings on his birthday or anniversary. They are clearly days to be in remembrance of him. Clearly days when tears and reflection are appropriate. Days that belong just to him. The days that tear me apart belong in part to my living family and in part to the one who has gone where I cannot. These are the days when I must learn to integrate the joy and the sadness. Today, I think of my mum, who is a beautiful, unique and talented soul. She has given me everything and I love her more than she knows. I think of my grandmother, who continues to live an enviably full life and is one of the most peaceful people I could ever meet. I think of my mother in law, who never stops for even a moment and would do anything for her children and grandchildren. I think of my boys. My eldest, crazy and wild, funny and loving. My youngest, gorgeous and curious, healing in his very bones. My middle son, never far from my mind and always in my heart.